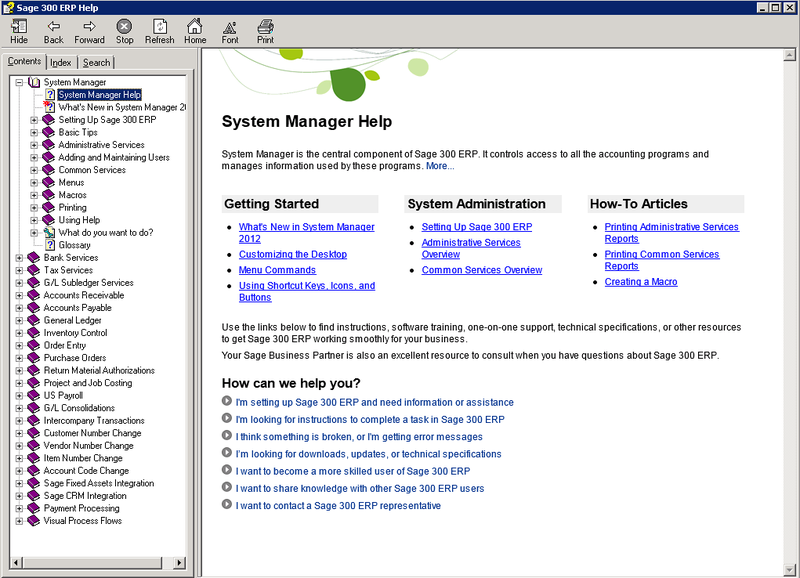 Because Sage 300 ERP Software no longer ships with hard copy product manuals, it’s important to know where to go when you hit a snag or just need help using a particular feature or screen. So in this article, we’re going to take a look at the built-in Sage ERP Help System. The on-screen tool provides a vast range of information, how-to’s, and step-by-step guidance that will help you navigate the ERP system and answer most questions right from within the software. When you first access the help system, the tabs may be hidden. Click Show to view all of the tabs. The Contents Tab allows you to access the Table of Contents of your entire Sage 300 ERP system, which is grouped by module. Clicking on the book icons will expand and collapse the content of each book. As you can see, the built-in Sage ERP help system can be a real life saver when you hit a snag or need to get a question answered quickly. If you need further assistance, or if you have a more advanced question or Sage 300 support request, please Contact Equation Technologies directly. If you would like PDF manuals please contact us directly at info@equationtech.us.